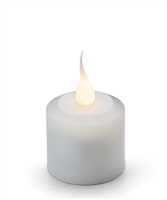 This "auto-on", water resistant LED tea lights are among the most advanced wireless technology for rechargeable candle systems. They have a more realistic flicker and authentic glow and have a 26 hr run time with only an 8 hour charge. 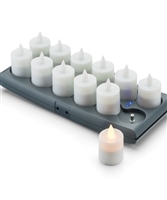 The charging tray holds up to 40 tea lights and the candles will glow red when charging or green when fully charged. With the magnetic candle base holds the candles securely to the tray. The ergonomic design of the tray makes it easy for one-hand carrying while replacing with the other hand. 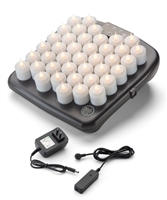 Includes 40 tea-lights in a True Candlelight LED Color, Charging Tray, Remote and Magnetic Cord & power supply. The V12 series leads the commercial value category of Nickel Metal Hydride battery rechargeable systems. A 10 hour charge provides up to 14 hours of run time. The convenient USB charging adapter will operate with any USB hub or power connection. Available in flickering Amber LED only. Our line of flameless wax pillars utilizes the newest technology available. 9 4/4" D x 16"H. 3.25 Gallon. Minimum quantity of 6 is required. 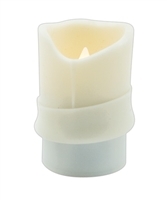 The ivory silicone sleeve fits easily over the Evolutin and Platinum rechargeable candles. A simple way to create an elegant, traditional look. 1.5" x 2.63". 12 Pack. (picture at bottom shows how to add the sleeve over the rechargeable to equal look like a pillar candle.) Ivory only. 1.4" Dia. 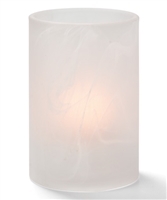 X 2.3" H 1/each True Candlelight LED only.